Well, December was that kind of month. That crazy prep for the Folsom Arts and Crafts show, then the dryer crashed, then the computer crashed, then my camera died-with 673 photos still on it, the back-up camera totally misbehaved - and is still, the car is doing whatever it's doing that now has me hoping every morning that it will start.....sigh.....sometimes life happens that way right? If it's going to go wrong it's probably all going to happen at once? Anything good happen in December? I had a fantastic birthday. Christmas was wonderful. New Years was perfect. Everyone in the family is healthy and happy and survived me! There's a roof over our head and food on the table. What else do we really need? I came to this country around the age of 4 with my mother. We are Korean. We eat rice - with everything. I don't really have any memories of potato dishes on the table. Then at 18, I left home for Ireland. 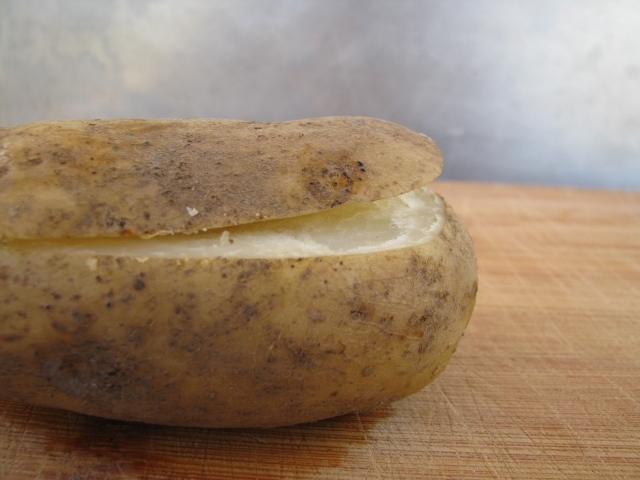 Potatoes, potatoes, potatoes! 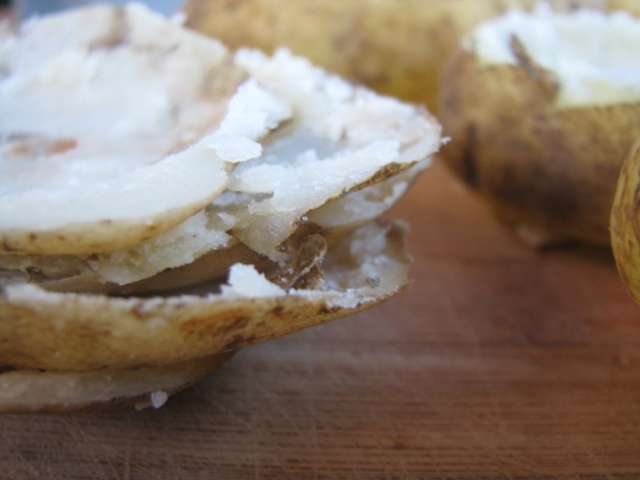 Although the potato did not originate in this country it definitely found a home there - both in history and cuisine. 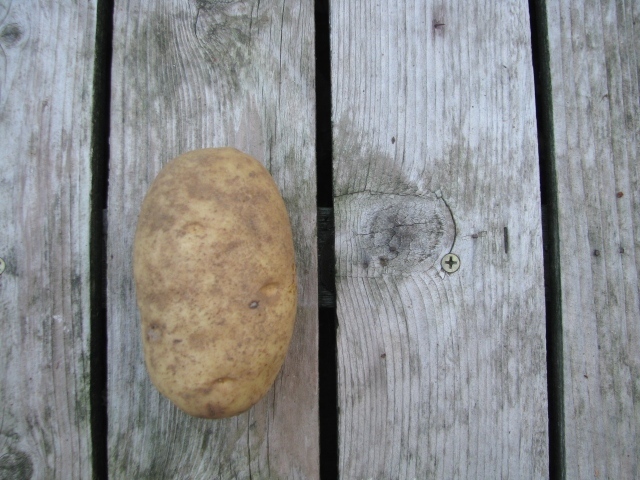 I had no idea all the things that could be done with a potato, or how many varieties there are, or how many pounds I would put on that year! Most everything was completely delicious. Some things completely unnecessary. All of it was definitely an experience I will forever be grateful for. 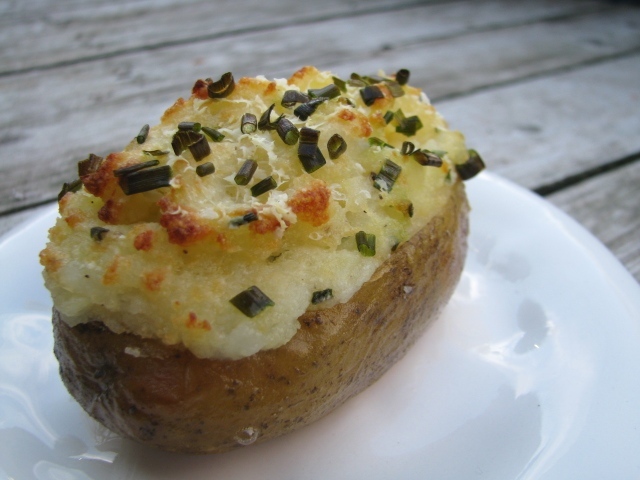 This is my basic recipe for twice baked potatoes that I think I got from my friend LKB. To this recipe I have added bacon, fennel, shrimp, a variety of various cheeses, the options are pretty endless of what you can add to this so I hope you experiment and enjoy. place onto baking sheet then into oven. flip halfway through baking so you don't get that hard spot on the one side. put in a microwave safe dish. cook for about a minute - or until it's all melted. using your sharpest knife slice off a little hat. again with your sharpest knife, make an incision all around the skin - this will make it much easier for you to dig out all the insides. insert a spoon right in the middle about a quarter of the way down then gently scoop out the flesh putting all of it into a large bowl. 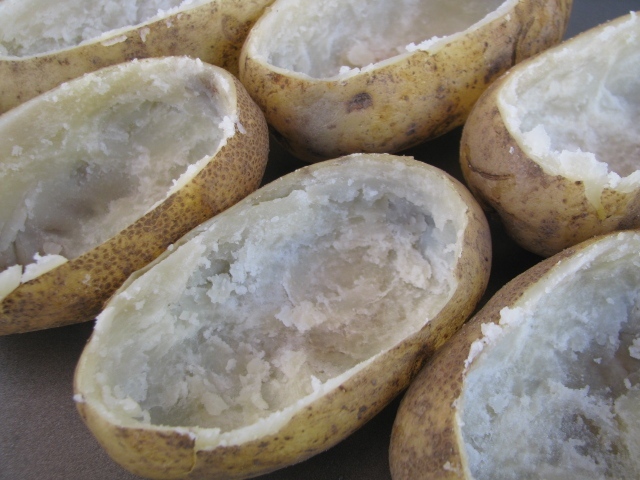 keep scooping until the potato skin is hollow. try not to crack the skin. don't forget to scrape the little hats as well. 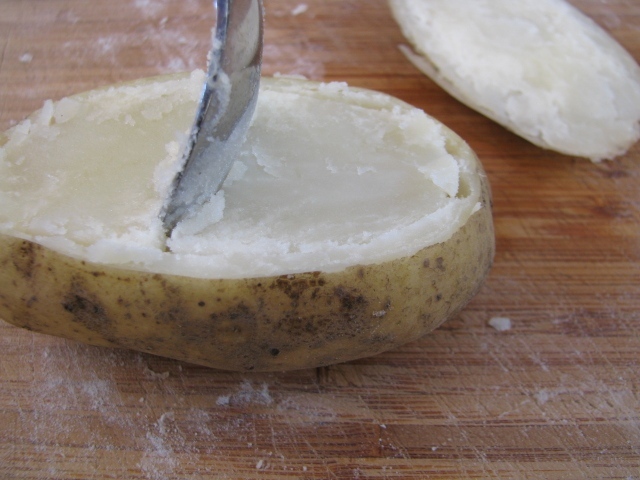 do this to each potato. place all the shells back on a baking sheet. 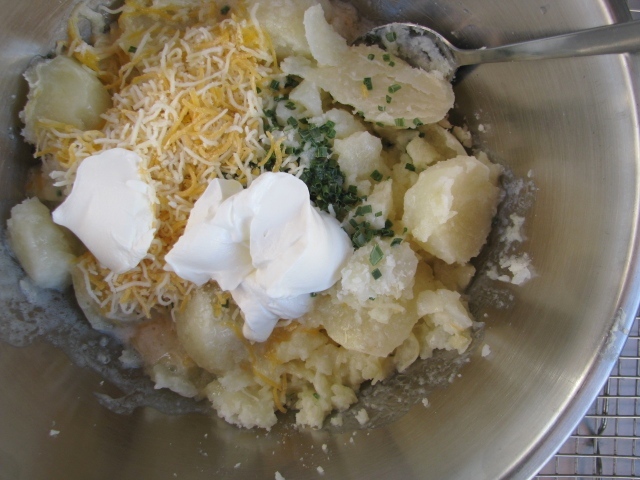 to the potato insides in the bowl add the sour cream, chives, butter (yes...all of it), cheese, salt and pepper. i do this with a fork because i like the little lumps. using a hand mixer works well and does give you a creamier consistency. taste to check if more salt and pepper is needed. evenly fill all the skins. grate parmesan cheese over the tops. sprinkle more chives over the top. 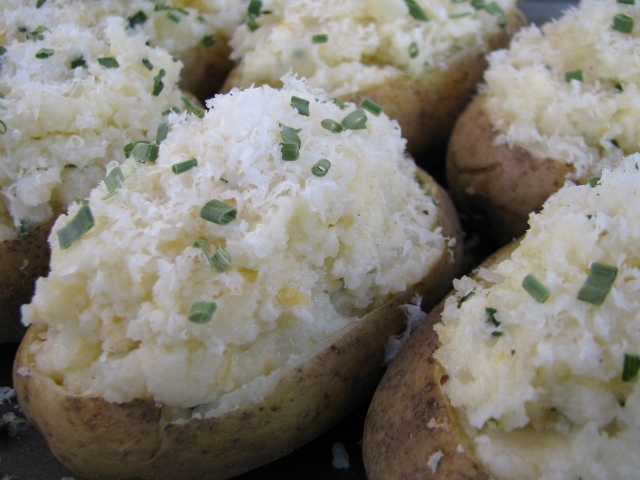 the chives can be added after baking if you want. into the oven for 30 to 40 minutes. or until the tops are brown and crispy. wait 5 or 10 minutes before serving - they will be very, very hot.